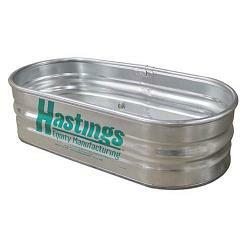 For sale is the Hastings 22GA Steel Round End Sheep Stock Tank, 2' x 1' x 4', 48 Gallon. Our round end sheep tanks are a Green Label tank (20GA bottom and 22GA sidewall). These shorter stock tanks have a wide variety of uses. The most common use of course is watering smaller livestock. These tanks have a one year warranty and the following features: G90 Steel throughout, 4-ply lock seams with contained sealant for maximum leak protection, .875" steel pipe rolled into the top of each tank to create a crush proof rim, long lasting zinc plated .75" one piece threaded plug assembly, largest selecton of sizes available to meet your needs. Hastings Equity Manufacturing offers a 1-year warranty on the Green Label sheep stock tanks.